in COLUMNS, EDITOR'S PICKS, MEDIA, POLITICS, WHO RUNS SAN DIEGO? When Voice of San Diego (VOSD) began online publication nearly a decade ago the excitement in progressive San Diego was palpable. Here, finally, was an answer to the biased reporting that had been a hallmark of the UT for years (even before it was purchased by Doug Manchester). The world of journalism was being revolutionized as the print media model became too expensive and cumbersome to compete in an instant access world. Slate and Salon opened their digital doors, and it seemed a new dawn of accountable news reporting was upon us. San Diego journalist/entrepreneur Neil Morgan and Buzz Woolley founded VOSD. Those were the days of Enron by the Sea, pension underfunding, indicted council members, resigning Mayors and special elections (sound familiar?). Heady stuff for this newly minted, but brashly confident, team of young reporters including Scott Lewis, Andrew Donahue, Will Carless andEvan McLaughlin. And lord knows San Diego offered a target rich environment for investigative journalism. During those halcyon years VOSD had the luxury of extensive financial backing from Buzz Woolley. But public non-profits have to keep bringing money in. In order to maintain its 501c3 status the organization had to make sure its money came from a wider base. Scott Lewis began to write less and work more with the nuts and bolts of running a web based non-profit dependent on donations. He took on the title of CEO. His tasks were to grow a membership, find generous foundations and donors, create strategic alliances and develop a functional website as the foundation of the enterprise. By all accounts he has done a credible job. 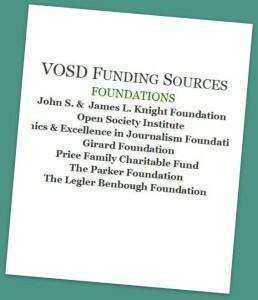 VOSD sponsors a number of conversations, breakfasts, forums and events throughout the year. Its annual Politifest has a permanent spot on the calendar of the politically interested. While many of the reporters from the 2005-2009 period have gone on to other endeavors, the finances of the group are improving over a tough 2011. Its 2012 IRS990 report shows a 41% jump in contributions/grants and a more than doubling of cash on hand over 2011. 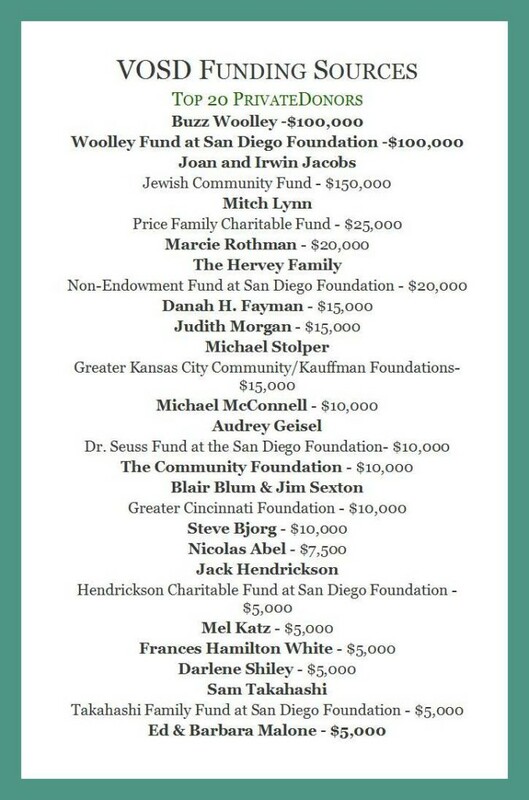 The list of its top 20 contributors includes several funds from the San Diego Foundation, the continuing generosity of Buzz Woolley, Price Charities and $150,000 from Irwin and Joan Jacobs. Its community partners include American Medical Response, Hughes Marino, and SDG&E. Of the $1,372,714 in contributions and grants received in 2012, $366,877 was from memberships. The success of the experiment will be determined by how VOSD deals with two related issues, inextricably linked to the question “Who Runs San Diego?”. First of all, it’s all about the money. Some may think that non-profits somehow rise above the struggle for the legal tender. Of course this is not the case and non-profits spend a very large amount of time and energy in search of the kindness of strangers. 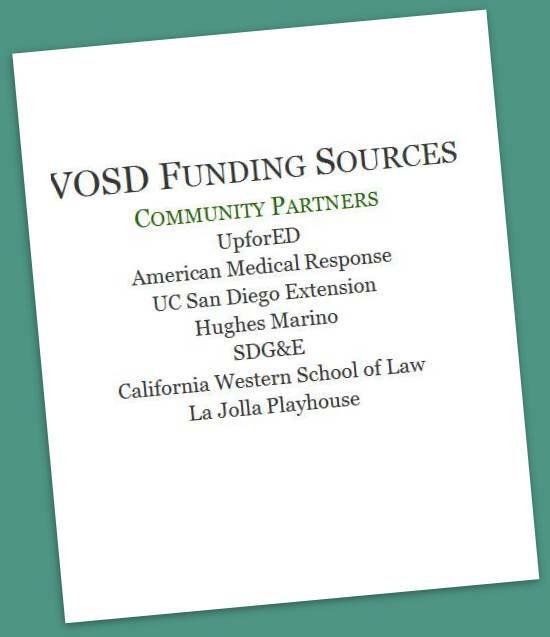 VOSD has many energetic and innovative efforts to raise money: its Meeting of the Minds program, Community Partners Program, and Politifest, to name a few. Just this week it began an attempt to crowd fund a new investigative reporter covering housing and development. Just as for-profit journalistic enterprises face questions about how much advertisers (and owners) influence what gets covered and how it gets covered, VOSD has faced questions regarding how it covers, or doesn’t cover, news involving high end donors and large corporate entities. Its coverage of the Plaza de Panama controversy, involving Irwin Jacobs, was criticized. Many readers took Lisa Halverstadt to task for what they perceived as a less than balanced reporting of issues involving orca captivity at Sea World. Others, myself included, thought VOSD overlooked some very important relationships and motivations in telling the story of the political demise of Bob Filner. These and other concerns have taken some of the bloom off the rose of the hopes of the progressive community that VOSD would take on the powers that be and do the ground-breaking investigative reporting it promises in its mission statement. Which brings us to the 2nd major issue: bias. Scott Lewis, the CEO of VOSD, is very clear when he speaks about bias in reporting. He does not even pretend not to be biased. The VOSD website guidelines for reporters states in oversized letters There is No Such Thing as Objectivity. Many would agree with that assessment, and even give VOSD a shout out for the sort of world weary hipster-noir blatancy of that statement. But here’s the thing: to just poke your cyber thumb in your journalistic chest and say “I’m biased. Everyone is.” is not enough. If you claim your bias, but fail to identify what your bias is, you’ve left off the most important part of the conversation. In seeking the answer to the media segment of our series “Who Runs San Diego?” we got a pretty clear picture of where Doug Manchester and John Lynch stand. They told us when they bought the UT that they really wanted to advance their extremely conservative agenda, that they really liked making money and they bought that nice little newspaper and the land it sits on to do just those things. VOSD does not provide that level of clarity. Certainly they have a nice turn of phrase: “We are guided by an ability to be transparent and independent, to clearly assess what’s going on in our community and have the courage to plainly state the truth”. It would be good, given that there is no such thing as objectivity, to provide some clarification as to which truth it is that will be plainly stated. San Diego wins having an online publication that works hard to bring the interested citizens information and venues to share information and ideas. Could it be fiercer? Yes. What Simple Thing Can You Do to Address the Problem? Give a couple of bucks to crowdfunding. Give VOSD the opportunity and encouragement to be a little fiercer. Write an opinion piece. I am astounded at the expertise and concern demonstrated by many activists in San Diego. Tell your story. Tell it at VOSD. Tell it at San Diego Free Press. Tell it at OB Rag. Tell it at your non-Manchester-owned community weekly (which we’ll be covering next week). Linda Perine is the President of DWC, an avid cyclist and tennis player. This is the fifth installment of the Who Runs San Diego? series, a project of the Democratic Woman’s Club, published weekly in the San Diego Free Press. The Democratic Woman’s Club mission is to promote Democratic Party principles including equality of opportunity, a level playing field, and fair and equal treatment for all. I think Perrine is accurate, and shows a valid charity with the VoSD experiment in non-profit, online, public-benefit news media. I’ve generally liked the quality, objectivity, and professional reporting of VoSD staff over the years, and I contribute small donations, but I’ve also had a tough time stomaching some of their stuff, especially some of the multi-media commentary that was produced for other local broadcast media interests. That’s probably as it should be, if I agreed with them all the time, they wouldn’t be doing anything for me. Yet it concerns me that, like other Public Media corporations, they get much of their funding from large corporations and corporate foundations, large donations from private individuals, and a minority of their funding from small contributions from members. I would like to see this model work, but I’d also like to see a commitment from the tax-exempt, non-profit, public benefit corporation to limit large donations to, say, 10% of total annual revenues, just to avoid the appearance of bias. One other thing to think on, Linda says “If you claim your bias, but fail to identify what your bias is, you’ve left off the most important part of the conversation.” I don’t think that’s enough, as a professional journalist you need to make a commitment to the objective truth, and that means knowing your biases, exposing them, but then attempting to avoid them, and opening your reporting to valid and accountable critics to correct any bias or errors in your work. Just because everyone has a point of view, doesn’t mean that the facts aren’t objectively knowable.